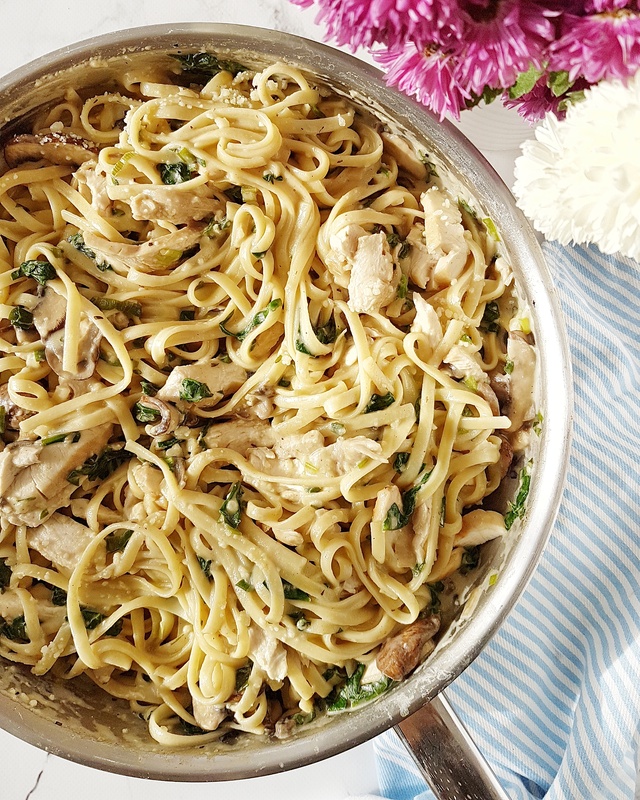 Low Fat and Dairy Free Creamy Chicken Florentine Pasta that can be done in 30 minutes. A perfect weekday or weekend meal! First of all, I’m now back after a long and much needed break. Sometimes social medias just get too overwhelming and something has got to give, family or blog so I chose the latter. If you want to see my latest recipes then head over and follow me @deliciouslittlekitchen on Instagram. I have ask my followers on Instagram whether I should post this recipe or not in my stories and 97% voted for yes! Thank you for taking part of the poll if you were one of them. It’s really fun to find out what you like me to post and I really appreciate your support! This meal is dairy free and low fat, also can be done in 30 minutes! Perfect for a busy weekday after work. All you need to do the night before are soak the cashew nuts, slice up the mushrooms and wash the spinach. Use a salad spinner to drain the water as much as you can then out the spinach in a freezer bag or a container and close the lid. I have made this recipe a few times and have tried with dairy milk and with cashew milk and both taste equally delicious. This time I used cashew milk. You can totally make this without chicken if you are vegan. We all devoured this last Saturday. You probably wonder what the heck has the word “Florentine” to do with this dish right!? Haha It’s actually just a culinary term or recipe that is served with spinach. You know, to make it sound fancy and all. Start by cooking the pasta while you prepare the sauce. In a large frying pan, add oil and heat up over medium heat. Fry the chicken breasts for 1 minute each side or until cooked through. Remove and set aside. In the same pan, add the spring onion and mushroom and fry until the mushrooms are brown. Remove and set aside. In the same pan, add more olive oil and add the pressed garlic. Keep stiring for 30 seconds, add milk, broth and flour (make sure the sauce is not hot before adding the flour, the flour will turn lumpy otherwise). Keep whisking/stiring until the sauce has thicken up. Add salt and pepper to taste then add the spinach leaves and stir until they have wilted. Cut them up first for little eaters. Slice the chickens and add them with the pasta and mushrooms to the sauce. Give it a good mix and let it stand for 5 mins with a lid on. Serve with parmesan or nutritional yeast for dairy-free. 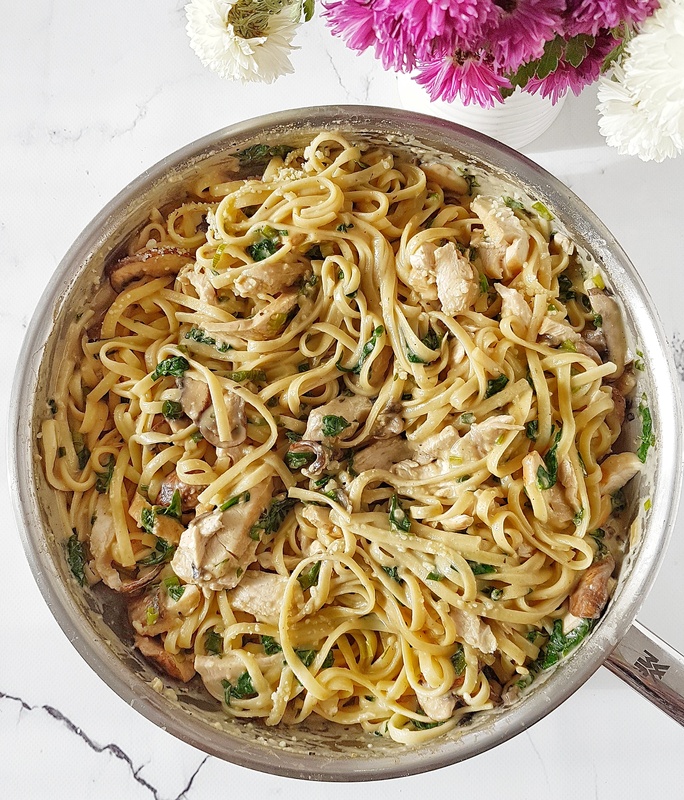 Posted on November 14, 2017 November 20, 2017 by deliciouslittlekitchenPosted in Baby_12 months, Family Meals, Lunchbox, Toddler & Family Meals, Toddler Meals, Vegan RecipesTagged #familyfood #dairyfree #lowfat, #glutenfree, #healthytoddlerfood, #toddlerfoodideas #chickenpasta.